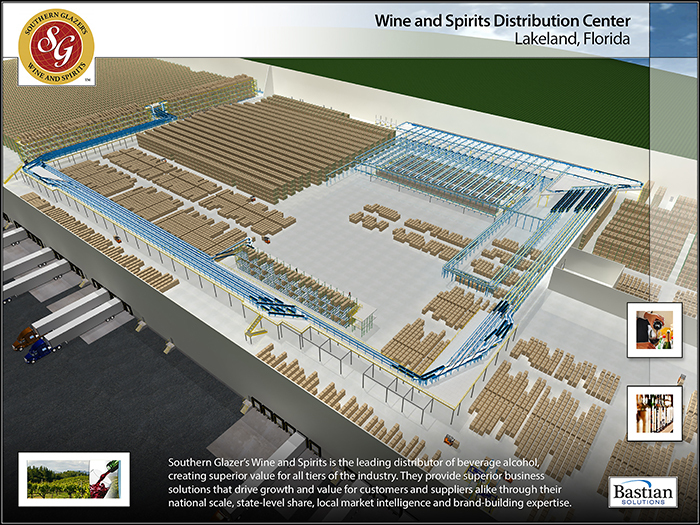 After consolidating all the inventory and functions of its Florida facilities into a single location, Southern Glazer’s Lakeland, Florida, facility is now the largest spirits and wine distribution hub on the planet, standing at an impressive 1.2 million square feet. After consolidating all the inventory and functions of its Florida facilities into a single location, this facility is now the largest spirits and wine distribution hub on the planet. Cargill is an international producer and marketer of food, agricultural, financial and industrial products and services. Founded in 1865, Cargill employs 139,000 people in 65 countries. For over a century, JFC International has thrived in its role as a distributor, bringing an ever-expanding line of quality Japanese food products to the United States. .
Bastian Solutions helped the Southern Wine & Spirits facility in Pyallup, WA increase their order throughput and picking. C&H Sugar produces cane sugar and molasses for the vast U.S. market. The Crockett, CA refinery processes over 700,000 tons of pure cane sugar annually – more than 70 types, grades and package sizes, including packaged consumer sugars as well as packaged, liquid, and bulk granulated, industrial-use cane sugars. King's Hawaiian is a producer of specialty bakery products including breads, rolls, and cakes. Southern Wine & Spirits is a leading distributor of beverage alcohol creating superior value for all tiers of the industry, and they turned to Bastian Solutions for a new warehouse in Shakopee, MN. The Chelsea Milling Company is operated by a family whose roots in the flour milling business date back to the early 1800’s, and their private business has been milling flour in Chelsea, Michigan for over 120 years. At SWS Oregon's distribution center, a new conveyor system, pick modules, and software help the company better service customers and improve employee engagement. Crown Holdings, Inc., is a leading supplier of aerosol packaging, food and beverage packaging, metal closures, and specialty packaging products for consumer marketing companies around the world. Pepsi-Cola of Central Virginia (Pepsi CVA) is a 100-year-old, third-generation family business located in Warrenton, Virginia. The distribution center services 7 counties and ships up to 4 million cases of product each year. With the installation of an automated order fulfillment system, Pepsi CVA reduced employee overtime, increased shipment accuracy, and created a calmer, more structured facility environment. The Virginia Department of Alcoholic Beverage Control (VA ABC) which is located in Richmond, Virginia controls the sales and distribution of alcoholic beverages in the Commonwealth of Virginia. Hussmann provides products and solutions for preserve and displaying fresh foods. They provide services to help food retailers be more efficient. S. Abraham & Sons, Inc.
S. Abraham & Sons (SAS) had many objectives in mind when they decided to expand operations into a new facility in Greenfield, Indiana. From a corporate perspective the objectives were clear. Wawona Packing Company in Cutler, CA is a family owned company that grows, packs, and sells their fruit domestically and overseas. The Wawona label, “Sweet to Eat” is considered one of the top quality labels in the California tree fruit business. Interested in a finding a solution for a food & beverage-related project?